We need to switch to renewables fast. And I want to help make it happen. 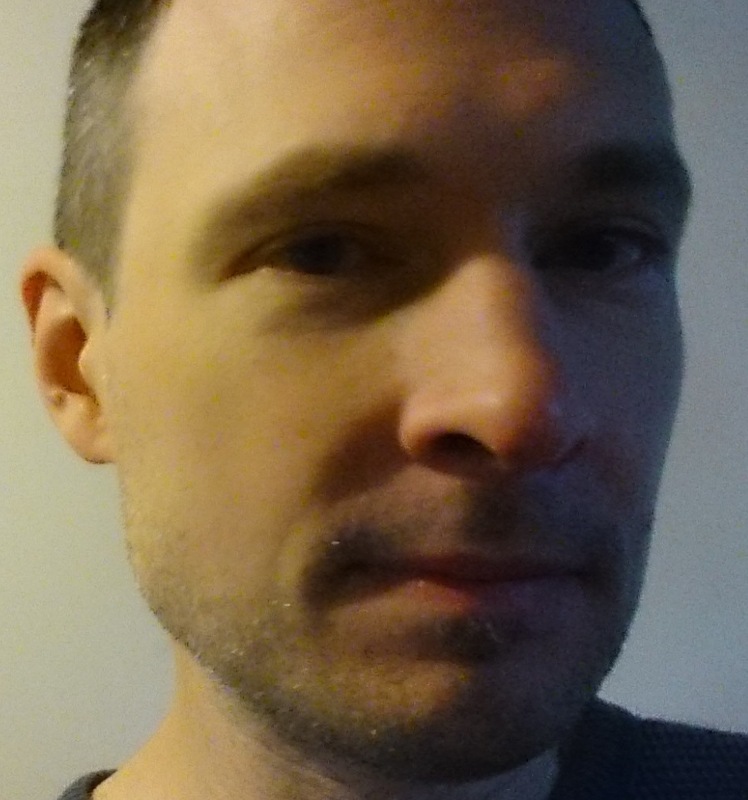 I am a software engineer with more than 20 years of experience and a passion for renewable energy. I have decided to turn this passion into my career and use my abilities to help speed up the transition to environmentally sound, reliable and affordable energy sources. This web site is an outline of my professional experience and other skills I have gained outside my day job. If you want to get in touch, please drop me a line in the contact section below. You can also download a PDF version of my resume or visit my LinkedIn page. I graduated with a Master's in Comp. Sci. (Informatik) from the Vienna University of Technology in Vienna, Austria in 1999. While working on my Comp. Sci. degree I also completed about four semester's worth of course work in Applied Physics (Technische Physik) at the same university, but I did not earn a formal degree. In early 2018 I completed Andrew Ng's Machine Learning class and his Deep Learning Specialization on Coursera: See here and here. Here is a list of jobs I have held at different times in my professional career. There are also a few patents that have my name on them. Some projects I have worked on that were not related to my day job. There is also a PDF version of my resume and my LinkedIn page. I have recently joined Station A, where we develop software to help accelerate the deployment of renewable energy sources. At Maxta I designed and implemented large parts of a data storage solution for virtual machines and containers. The architecture was distributed in nature, with no central point of control and no single point of failure. The goal was to build a unified storage pool out of off the shelf servers. The system was self-healing and would automatically compensate for storage device or entire server failures. Here you can see me talk about what we developed at Maxta. As VMware started to penetrate enterprise datacenters, customers realized that conventional data protection approaches did not scale in virtual environments. At that time backup vendors were also unwilling to adapt their products because datacenter virtualization was still fairly new and represented too small a market. Tasked to address the problem, I ended up developing a vendor-agnostic framework for wiring existing backup applications into VMware’s infrastructure. As adoption of virtualization in the datacenter grew, software vendors were eventually willing to adapt their products and the framework turned into a set of APIs around which an entire ecosystem quickly developed that is still thriving today. Over the years I also made various presentations on this topic at VMworld. I also spent some time working on VMware’s VSAN distributed storage project. I freelanced for TBR during my college years in Austria. TBR developed software for design and manufacturing. The biggest project I worked on was a facility management application for the Dürnrohr power plant. The software was later adapted for use in other power plants as well and to my knowledge TBR continued to maintain the software until the plants using it were decommissioned. Other projects were extensions for CAx applications (AutoCAD, for example) that manipulate 3D CAD models. UNM was a fabless chip company that developed a "dataflow processor": A custom chip design consisting of a large number of simple processing cores with DSP-like capabilities centered around a message-passing architecture. I developed memory management and scheduling routines for the processor that can be called a simple operating system. The company was later acquired by QLogic. Integratus and Scale8 were both companies developing distributed storage solutions. Unlike my work at Maxta, these companies attempted to design a general purpose distributed storage solution that was intended as a replacement for a filer. Napster was an early peer-to-peer file sharing platform. Its primary purpose was to allow users to share music. I briefly worked at Napster on the DRM system, when the service was shut down and the company was trying to overcome its legal challenges. At xS+S I developed a special-purpose Linux distribution. This also involved bug fixes and enhancements to various open source components, including the Linux kernel. The distribution that I developed enabled xS+S to provide products such as diskless Linux workstations. The company later specialized in environmental monitoring/data visualisation solutions. For example, xS+S powers the Numbis, the air quality reporting portal for the state of Lower Austria. 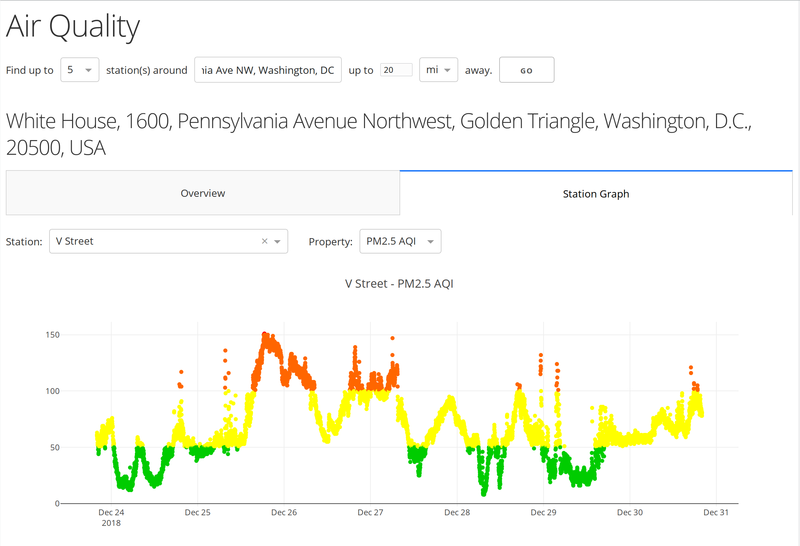 A Python script using dash and plot.ly to find the Purple Air sensors closest to a given location and visualize their sensor data. 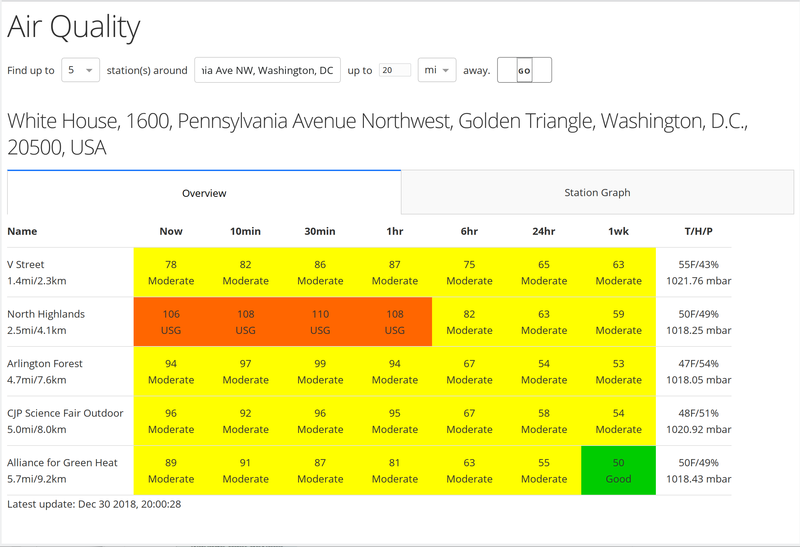 This was born out of frustration with the EPA air quality page often being slow to update or not providing any data at all for several hours during the 2018 California wildfires. The bus stop outside my house doesn't have a sign. So I built one. The bus stop outside my house doesn't have a sign showing arrival times. So I built one out of an 8x80 LED matrix and an old first gen. Raspberry Pi I had lying around. It shows a bit more info than the usual Muni signs. The smart picture is a 7.5" electronic ink display that is controlled by an embedded chip. It is designed to run off a rechargeable battery for about two weeks, while still updating in one minute intervals. In order to be able to minimize battery drain and to fit into the small footprint of an embedded controller, the data gathering and rendering is done on a Raspberry Pi (that is already serving other purposes). 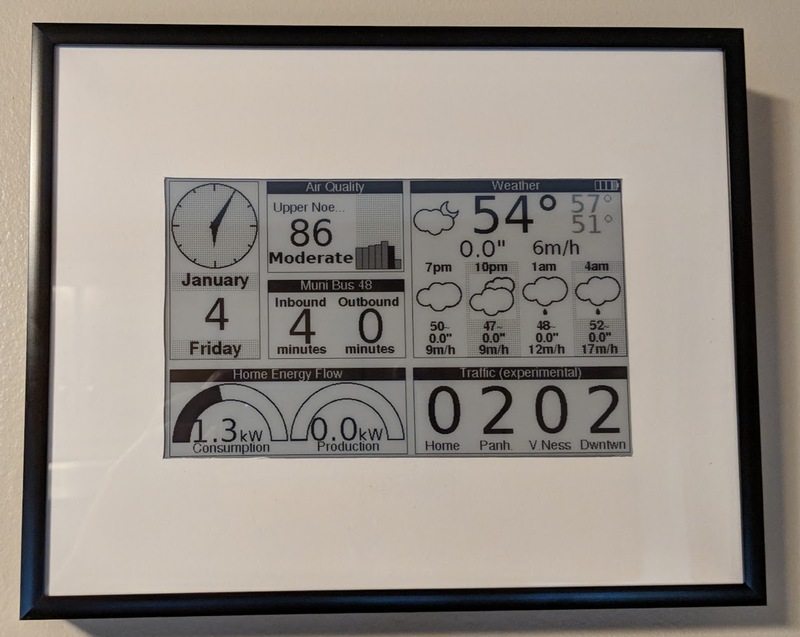 Also, in order to preserve battery on the smart picture, the code on the Raspberry Pi has to anticipate future requests coming from the smart picture and have a new image rendered by the time the next request arrives, while not serving out stale data. The project is available on bitbucket. Documentation for the library I wrote to render the glyphs on the display is available here. 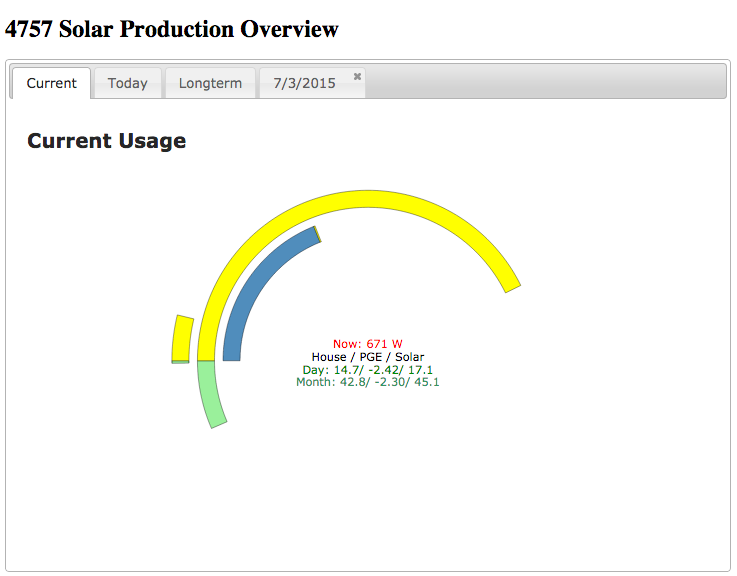 Solar Aggregator tracks the energy flow in our home. 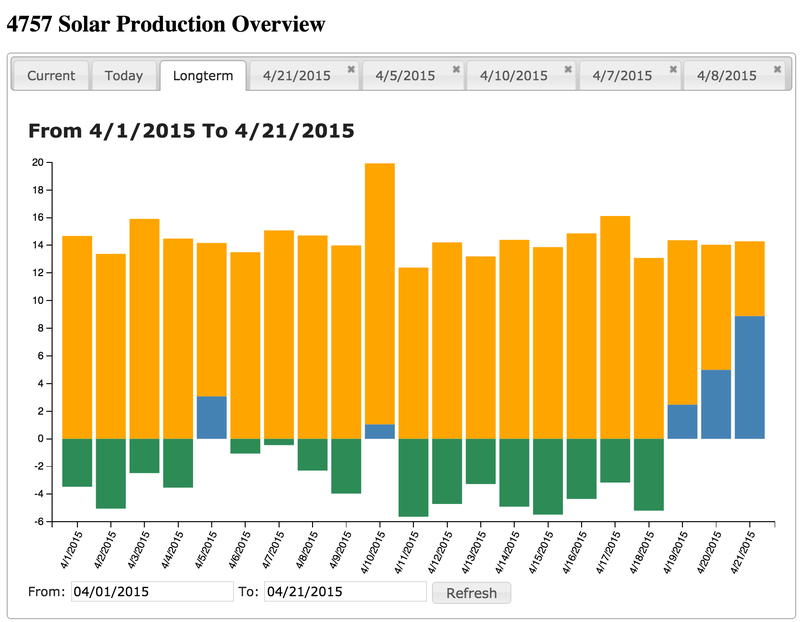 When we installed solar panels on our home I wanted to be able to track our net power flow to/from the grid and track our power consumption. 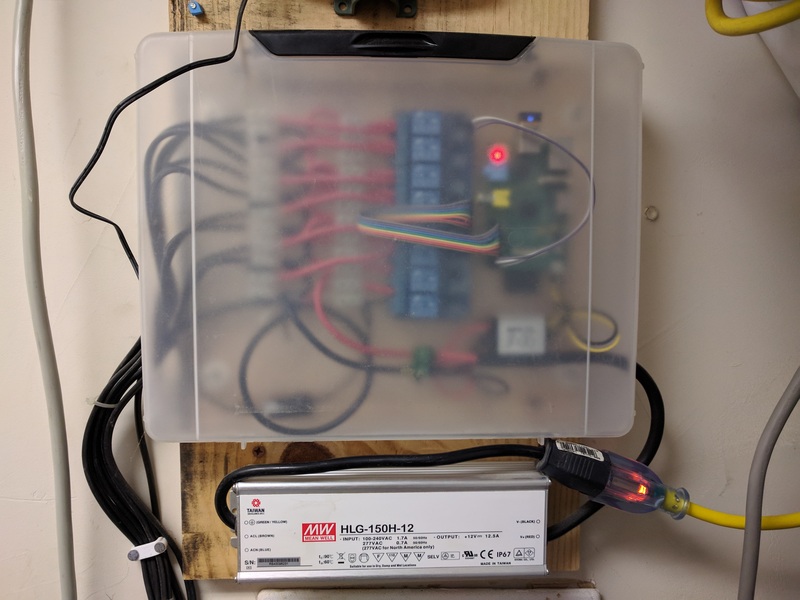 Solar Aggregator gathers production data from the solar inverter and the PG&E smart meter (via a Zigbee gateway) and stores data every 5 minutes in a database. 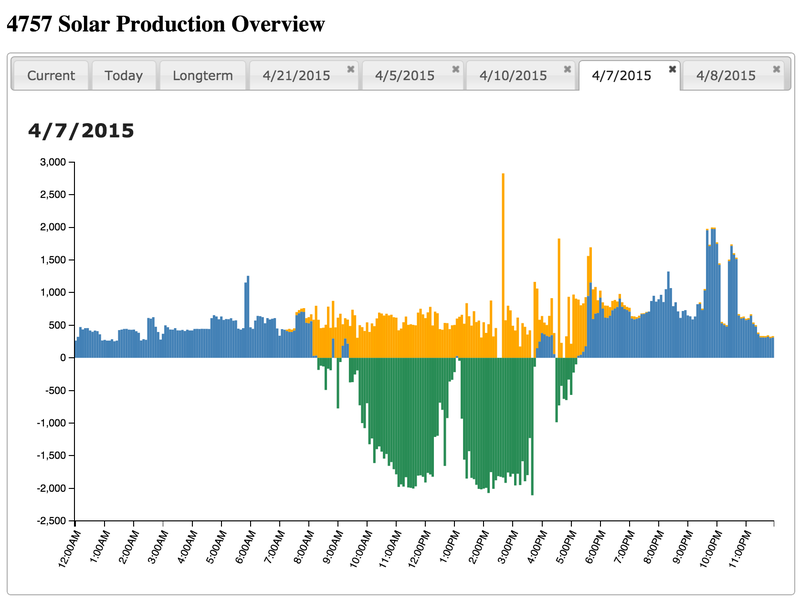 There is a web UI for querying data and for visualization. The project is also available on bitbucket. 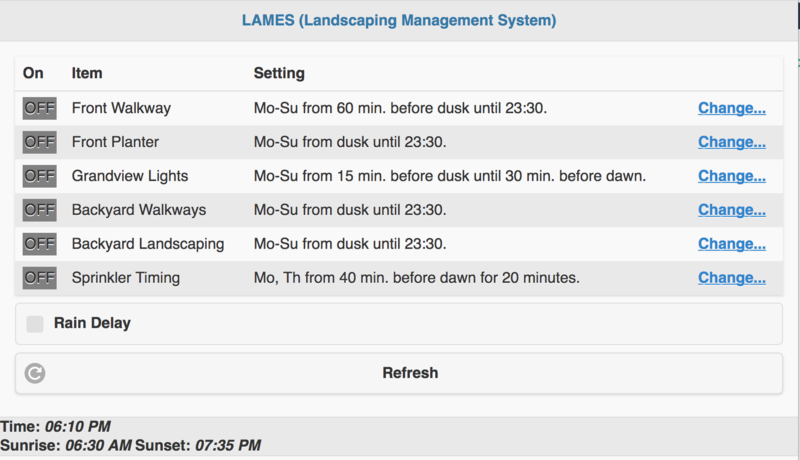 LAMES is a hardware/software solution that controls exterior lights and sprinklers. Lights can be turned on/off via a web UI, or according to a schedule. Times can also be specified relative to sunset/sunrise. The sprinklers can be activated according to a schedule as well, with manual override. Over the years I have also dabbled in woodworking. Some thoughts and a recent project are documented here.